Surely the best gluten-free scone recipe I've had made! These fantastic scones are soft and crumbly with a nice golden crust. They taste most delicious still slightly warm, filled with butter and sweet strawberry jam. Mix all dry ingredients (GF bread flour, oats, sugar, xantham gum and soda) in a bowl. Make a well in the middle of the crumbly mixture and pure in egg and buttermilk. Combine gently wet and dry ingredients together. Don’t over mix it, so the mixture stays light. Turn it on to a floured countertop. Gently pat it and shape out a circle approx. 2 thumbs thick. Don’t squeeze out all air. 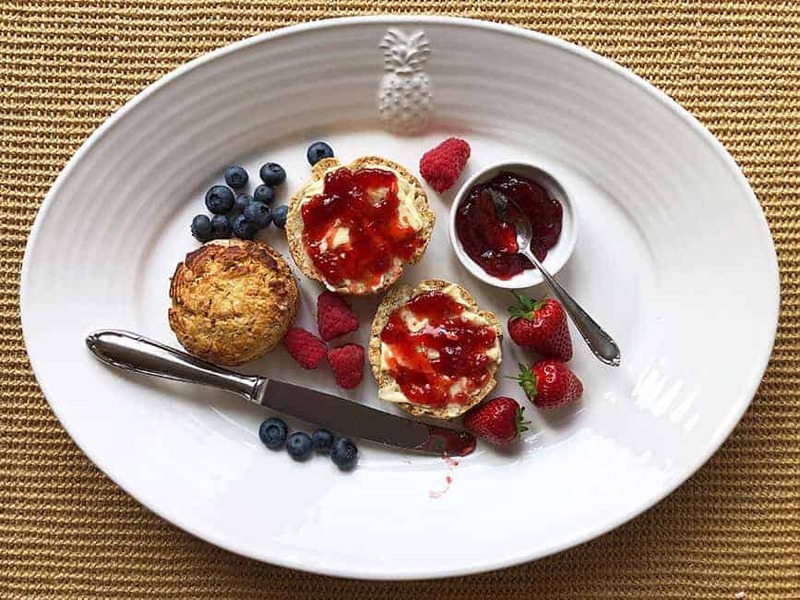 Use a round cutter shape (5.5 cm in diameter for smaller size scones – makes approx. 12 pc, or my favourite, 6.5 cm in diameter cutter – makes 7 bigger scones) to cut circles from the dough and place them on a tray covered with a baking paper. Twist the cutter when cutting the shape out of the dough as it helps the scones to hold their round shape. 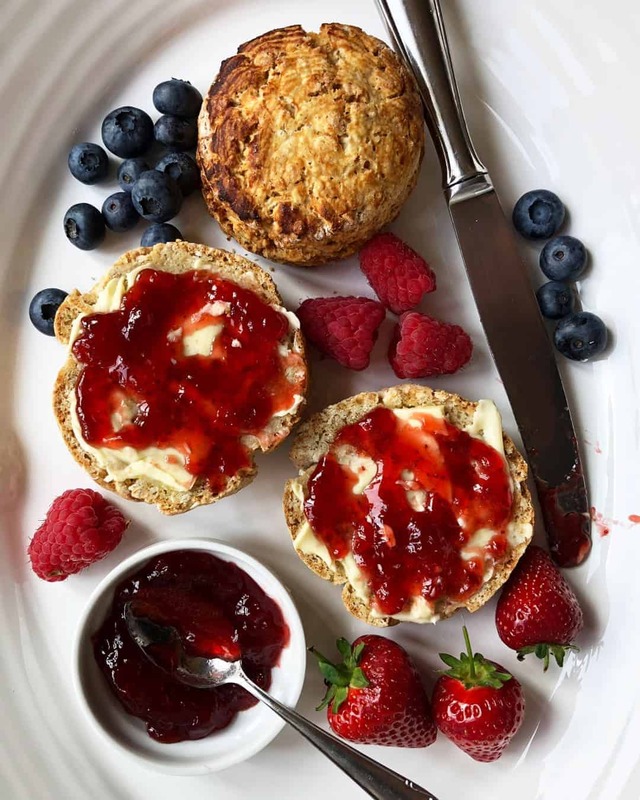 Brush the top of the scones with remaining buttermilk and sprinkle with caster or granulated sugar to add more colour to the scones. Bake until risen and golden. 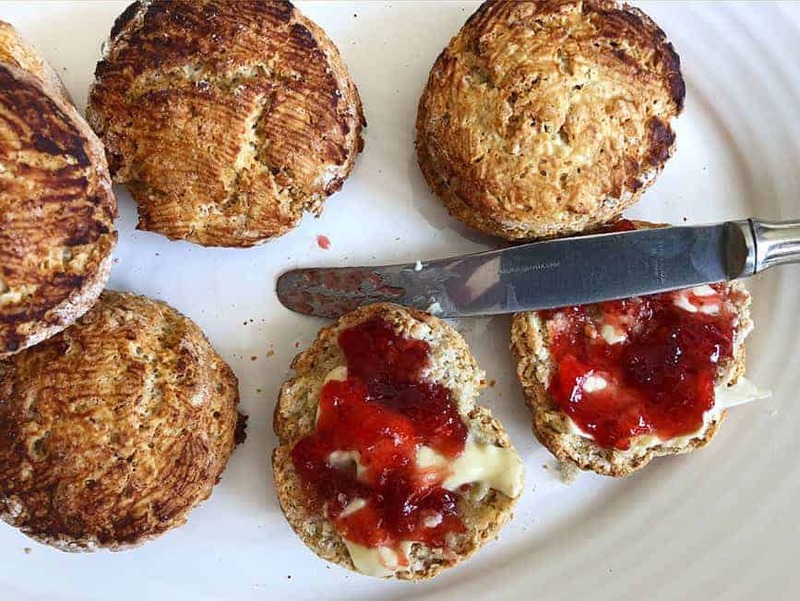 Small shapes take around 12 minutes to bake, bigger scones around 18 minutes. Once the scones are baked, remove them from the hot tray and let them rest on a wire for 10 minutes. For those that are not convinced and don’t want to buy citric acid, you can replace it with cream of tartar (1=1) or vinegar (1/2 tsp of citric acid = 1tsp of white vinegar). If you don’t have buttermilk either, replace it with plain white yoghurt (thick yoghurt needs to be diluted first to buttermilk consistency). The scones will look pretty much identical but we prefer the taste of the buttermilk and citric acid version. I would like to note here, that the reaction that creates carbon dioxide gas and helps the scones rise, happens once you add liquid into the mix. It’s necessary to work with the dough quickly and without prolonging the time put the scones in the oven. Please, make sure you are not sensitive to protein avenin in oats if you are celiac as it is similar to gluten. However, according to Coeliac.org.uk, most celiac people can tolerate it. Our Sunday mornings almost always evolve around a sweet family breakfast. 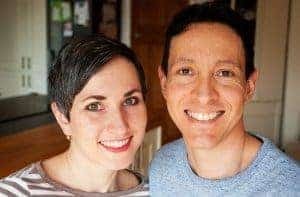 We usually swap between a few favourite recipes – gluten-free griddle waffles, traditional French crepes, gluten-free fluffy blueberry pancakes and gluten-free Irish soda bread. I occasionally used to make English scones for our Sunday breakfast too but since I am trying to reduce how much gluten we eat I decided to find a gluten-free alternative. At first, I looked for inspiration online but none of the recipes I’ve found worked for us. Then I tried to create my own recipe but my first experiments weren’t very successful either. It was my husband’s gluten-free Irish soda bread recipe that inspired me to try again. It’s not always easy to find a good gluten-free recipe alternative to normal flour but because we all love scones I was determined to get my gluten-free scone recipe right. After a lot of trial and error, I believe I’ve managed to find the right combination. This recipe is made with gluten-free Doves farm bread flour as it is wildly available here in the UK. I tested this recipe with Doves Farm gluten free plain flour as well but I felt like their bread flour behaved somehow better for this recipe. I also use buttermilk and citric acid to add some acidic ingredients that react with soda and help the scones to rise and neutralise soda’s taste. I understand that citric acid might not be very common ingredient people usually have at home but it is a very versatile product. It’s often used when making homemade jam, a cake icing and fondant, or even bath bombs. It’s also effective for cleaning and removing soap scum and hard water stains.